After Cúcuta: what type of intervention? The tumultuous events of February 23 at the Colombian borders leave a few things clear for the world. 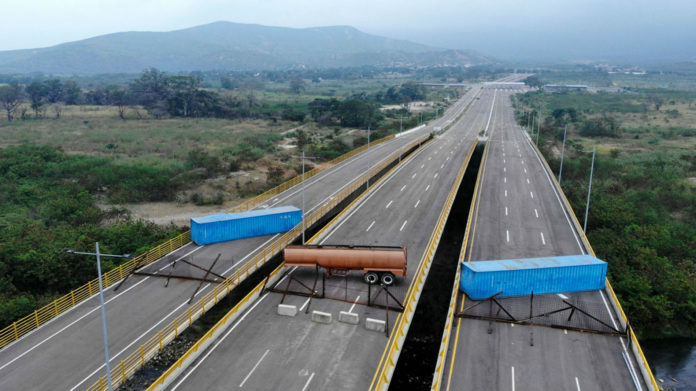 1) the regime is not that strong: it had to use its assault militia, "colectivos", to push back and burn trucks of humanitarian aid. The army apparently is not that reliable, as underlined by scores of military crossing over to Colombia. 2) the regime will do anything to remain in office. Murdering people in the most abject forms is not a problem for them, not even a brief qualm. 3) the choice now is between a strong move or letting Venezuela rot, infested with Colombian guerilla and drug traffickers with a new wave of emigration that this time could reach 5 millions within a couple of years. What would be the choice of the international community now that it is demonstrated that the opposition is a large majority who has tried any possible conventional political means, leaving hundreds of fallen? Trying to speak about what goes on from afar is reckless. Local information is not good, does not understand what has been going on in Venezuela, let's its own bias take over. Following tweets does not help much. Opposition tweets are transfigured. Chavista tweets are beyond denial. Even were I to be in Venezuela it would not have been too easy: massive shut down of any media that shows the Cucuta concert , including Nat geo (or that may discuss the massacre of natives at the hand of the Nazional Guard at the Brazilian border). Thus I have to resort to go to bed with some comfort pill and hope for a nicer wake up tomorrow morning. One thing is certain though: the only way out for Maduro is a blood bath. Or a yellow uniform. When you read this I will be flying above some ocean. The picture below has been flying all around the world from different angles. It is one of the most perfect symbols of the crap that chavismo has always been, just exacerbated these days. I was distracted with other issues, so let's have a quick catch up, in what seems to be now the usual mode, item by item. What is the legal status of Juan Guaido?